Providers of commercial solutions to the furniture and fit out specialists. Workspaces, restaurants, hotels/motels, conference, education, retail stores and more. Titan is a multifunction business that strives to allow its customers to tap into its resources collectively. As you will see from Titans extensive range of offerings we can assist your needs. Whether it be completed finished furniture or part of your fit out or installation through providing metal fixtures or upholstered products (soft finishes). Titan’s story begins in 1977 in a factory in Avondale Auckland. Named then as Titan Metal Industries the factory was shared between three other businesses and Titan used 40sq meters of the 110sq meter factory. The companies sole purpose was to supply reinforcing stirrups to the construction industry and shipped them nation-wide. Titan consisted of only three staff, one steel supplier and a few customers. Today the business Titan Industries Ltd, trading as Titan furniture now occupies the whole factory. As well as maintaining a full light engineering steel workshop, Titan has its own purpose-built factory to occupy the upholstery and warehousing business units along with a showroom and offices encompassing 34 – 36 Honan Place Avondale. 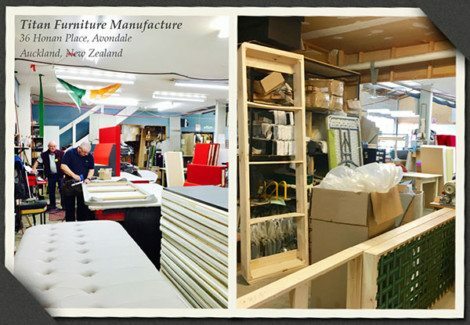 We have suppliers as far as Italy and as close as 26 Honan Place Avondale, Titan Furniture has grown our distribution to solidify customers throughout New Zealand and enable the market with competitive furniture solutions.